This cell model was developed by Penny Noble and represents the electrophysiological alterations in rat ventricular myocytes in type-I diabetes. It reads both in PCenv and COR and is able to produce action potentials under multiple stimuli. This model is a mathematical representation of the diabetic phenotype by incorporating changes in the ionic mechanisms that are suggested by experimental data to underlie the altered electrophysiological characteristics in the short-term, type-I model of STZ-induced diabetes. The model is able to qualitatively simulate the prolongation of the APD in accordance with experimental results. It provides novel insights into the ionic basis for this changes in the action potential profile during diabetic conditions, and illustrates the complex, nonlinear relationship betweeh the APD and both intracellular Ca2+ homeostasis, and E-C coupling. A mathematical model of the adult rat right ventricular (RV) cell was derived from the Pandit 2001 rat LV epicardial cell model, and used as the control model. 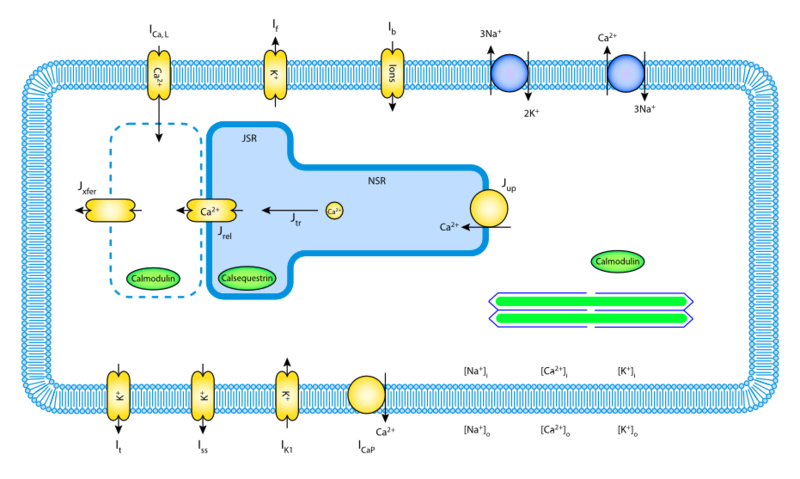 Further modifications from the control model were made to represent the short-term, rype-I diabetic myocyte. A variable Diabetes is used to convert from the normal to diabetic model. The default value is 0 for normal and any other value (usually 1) for diabetes. A fluid compartment model of the rat epicardial/endocardial ventricular cell. Derived from workspace Pandit, Giles, Demir, 2003 at changeset 6081bb8231a0.